A six -oint gap has opened at the top of the Elverys Super League after Ballina Town overcame Straide & Foxford United last weekend. 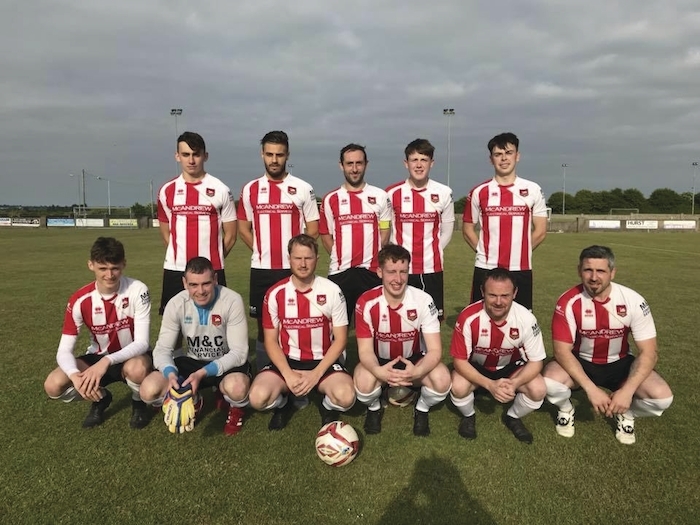 The North Mayo side went into round eight with a three-point lead over United and Westport United but with Westport not in action, a 4-2 victory over S&F put clear daylight between the teams at the top. Dylan McKee had given Mick Duffy’s side a half-time lead before Davog Doherty, Fabiano Macario, and an own goal had Town four goals to the good. Late strikes from Michael Guilfoyle and Conor Sherry were mere consolation for United. At the other end of the table Kiltimagh/Knock United moved out of the relegation zone with a 5-3 win away to bottom side Iorras Aontaithe. The home side were 2-0 ahead inside the opening half-hour and looked to be headed for their first win of the season but a Liam Groarke goal before half-time gave Kiltimagh a lifeline. Groarke then levelled after the break before Simon Jordan put Kiltimagh ahead from the penalty spot. Iorras though made it 3-3 before Jordan got his second of the day and Brian Morley rounded off the scoring as he wrapped up the three points for Aiden Flatley’s side. Ballyglass kept their unbeaten run going with a 3-0 victory over Ballyheane to move inside the top half of the table for the first time this season. Rian O’Connor, Anthony Killeen and Alan Plunkett with the goals for Tom Connolly’s side who have impressed in recent weeks. The other game played last weekend saw Claremorris throw away a 3-0 lead in the second-half to draw 3-3 with Manulla. Simon Butler, Dean Roddy and Danny Broderick put the impressive Claremorris into what looked an unassailable lead but Connie Morrissey’s side never laid down and stole a point after goals from Lucas De Paula, Jackson Da Silva and Matty Nolan. Manulla, last season’s runners-up, are now in the relegation zone and face a serious battle in the second-half of the season but this point could yet prove crucial in that battle. Ballina will have a chance to open an even bigger gap on one of their title rivals when they travel to Westport United on Saturday evening. Mick Duffy’s side remain unbeaten and with Benny Lavelle, Jamie Cawley and Dylan McKee continuing to impress in attack, many believe they will remain that way until the end of the season. A trip to Westport is the biggest test of their Super League credentials. The four in a row champions will be looking to get themselves right back in the title hunt following recent slip ups against Ballyheane and Claremorris. Thiery Baba has joined their rearguard and in attack they still look strong. Also on Saturday evening Kiltimagh/Knock United will be looking to move further away from the relegation zone when they host neighbours Claremorris at CMS Park. Kiltimagh were impressive in coming from behind against Iorras while Claremorris will have been disappointed with the concession of three second-half goals against Manulla. These sides have the second and third worst defensive record in the league while Claremorris in particular know where the net is at the other end also. With Danny Broderick and Dean Roddy picking up form it could go their way. Castlebar Celtic return to action after last weekend’s derby with Westport was postponed when they make the short trip to Manulla. Celtic looked to be Ballina’s main challengers this season but a defeat to S&F last time out has seen them slip eight points behind the leaders but with a game in hand. With Manulla languishing in the relegation zone Michael McNicholas will want to see his side back to winning ways. With the recent form of the likes of Colm Nevin and Ger O’Boyle they look capable of doing so. Iorras Aontaithe make the long journey to Ballyheane on Sunday still in search of their first win this season. Ballyheane know all about the struggle at the bottom of the table from last year’s campaign but don’t expect them to have any sympathy for their North Mayo opponents. Also on Sunday, Straide & Foxford will look to take advantage of any slip up by Westport the previous evening when they host Ballyglass. Tom Connolly’s side are on a three match unbeaten run but United are one of the hardest teams around to beat on their own ground. This one should be interesting.